Taken from the new album "Drown Your Heart Again" which will be released next week on the bands own label. The Southsea five piece will be celebrating this with a jaunt around the UK next month. Another winner from the Bad Panda Panda stable. This time it's the creation of what the press release describes as "one college kid living in Boston" which sounds rather sad in a way. Waht you do need to know however is that this track is taken from a four track E.P. 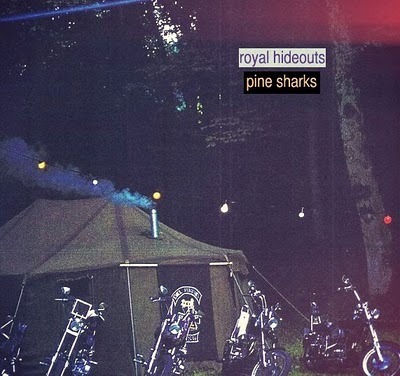 called "Pine Sharks" which can be downloaded from HERE and if you like that there is another E.P. called "Coral Casino" which is also available for free download HERE. Taken from the album "How You Bean?" which you can download in it's entirety from their Bandcamp page HERE. I mentioned Depth Charge in last weeks Fodder and that inspired me to dig out this record. If you like samples this is the track for you. Taken from the 1994 album "Nine Deadly Venoms" this should be played at immense volume. This is one of four tracks Truman Peyote have contributed to a new split 12" which they share with Many Mansions on the brilliantly named Whitehaus Family Record Label. If I remember I'll stick a Many Mansions track in next weeks Fodder. I posted a track by Calm Palm Vapour in a Fodder a couple of weeks ago but you wouldn't have known because I rather stupidly referred to them as Midstates which is what they used to call themselves. This is a track from their impressive debut album "Morning Pacific" which will be available soon. You can check out three tracks from this wonderful volume HERE. Taken from the album "Bedroom Adventures" which is available in digital format from the Hooray! Bandcamp page HERE where it will cost you five dollars or you can pop over to the Wonder Beard Tapes website HERE and get kitted out with very nice physical cassette. This track is taken from a free four thrack E.P. which you can download from HERE. It's been made available to promote the new Crocodiles album "Sleep Forever" which will be released on Fat Possum on 14th September. I love this record and for the last few years I have been wondering what happened to my copy which mysteriously vanished. After several years of trying to track down the thief it has turned up. I'd filed it under K.
I can't tell you a great deal about Humming Kitten except that this E.P. has been in my inbox for e disgustingly long time. As far as I can make out it's just a demo which may mean that it will be quite hard to track down. It is however well worth the effort as you can probably tell from this track. This is a track from a new compilation of old stuff by MJ Hibbett & The Validators. It's called "Forest Moon Of Enderby" and if you've never heard MJ Hibbett you should probably have a listen to this. Taken from the "Young E.P." which was released on Moshi Moshi last week.